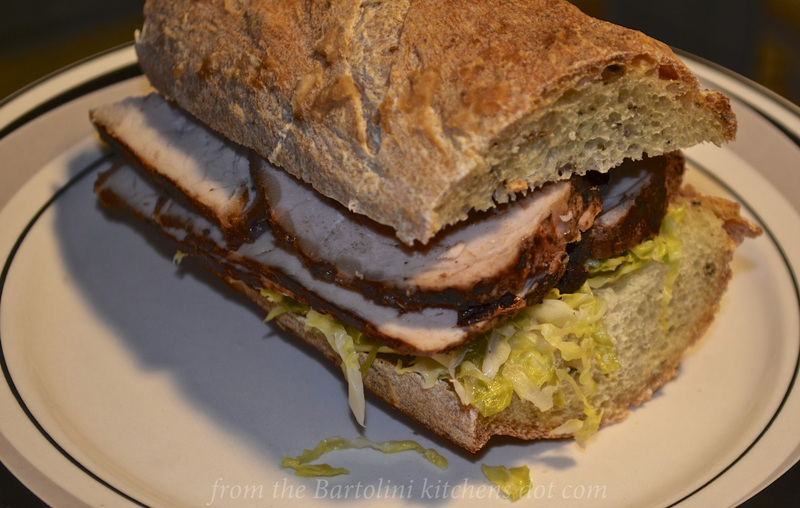 This entry was posted in Gluten-Free, Main Course (Secondi) and tagged Cooking, Food, Italian, Jam, Pork, Recipes, Sammich by ChgoJohn. Bookmark the permalink. Very creatiev,John,here in Holland the winter is almost finish,and this lovely dish I prefer to eat in the cold winter,with a nice glas of Nebbiolo,can be easy tasty with the balsamico vinegar. I agree with you, is easy to make the dish,but not your Eccellente Jam!Have a nice day. Thank you, Massi. As I write this, it is snowing heavily and we are expected to get as much as 8.5 inches (21.6 cm) in the next 10 hours. Winter refuses to leave! credo che sperimenterò questa nuova ricetta di prugne col maiale, ed anche tutti i delicati contorni che ci hai proposto…i tuoi 1100 followers, sanno di trovare qui sempre ottimi consigli e non possono preoccuparsi se una volta potrai saltare qualche passaggio da loro! ti ringrazio di tutto augurandoti una felice giornata! guess be experimenting with this new recipe for pork with prunes, and also all the delicate contours that you’ve proposed … your 1100 followers, knows to find always great advice here and can’t worry if you once skip some step by them! I thank you for everything augurandoti a happy day! You’re very kind, Ventis. Grazie mille! 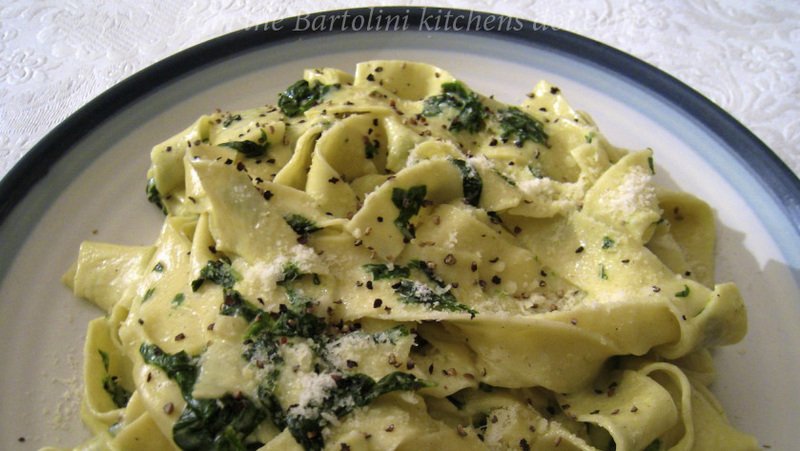 This recipe is a snap to make but it sure delivers a great result. Thank you for being so gracious and understanding. Thank you for being so supportive and understanding, BAM. The last few months, this blog has undergone a “growth spurt” that caught me totally off-guard. Some adjustments have to be made or it will stop being enjoyable, Then I’ll be in trouble. I hope you have a great week, BAM! 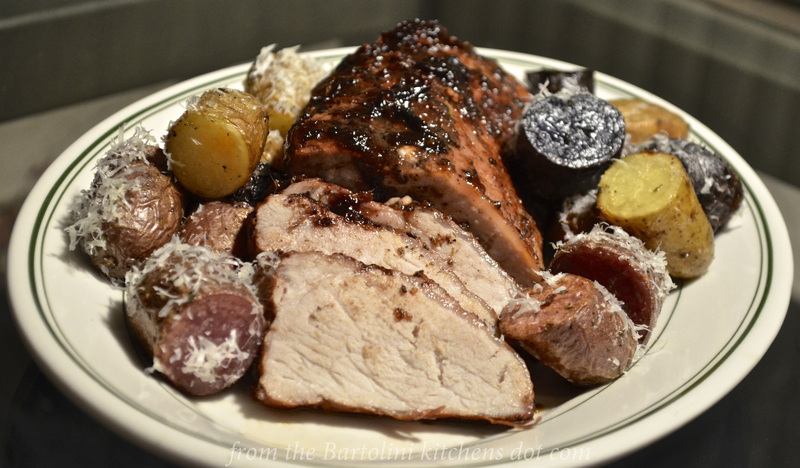 I love pork tenderloin but I’ve never served it with plum sauce. I’m dying to try it. My blog’s 3rd anniversary, officially, was January 1st, yet since December the number of followers has grown by 30%. I was blind-sided and have been struggling ever since. Time to regain control and I thank you for being so understanding and supportive. I share your experience, I too have been quite reluctant to can. I guess I’m afraid that I won’t get the jars sterilized! 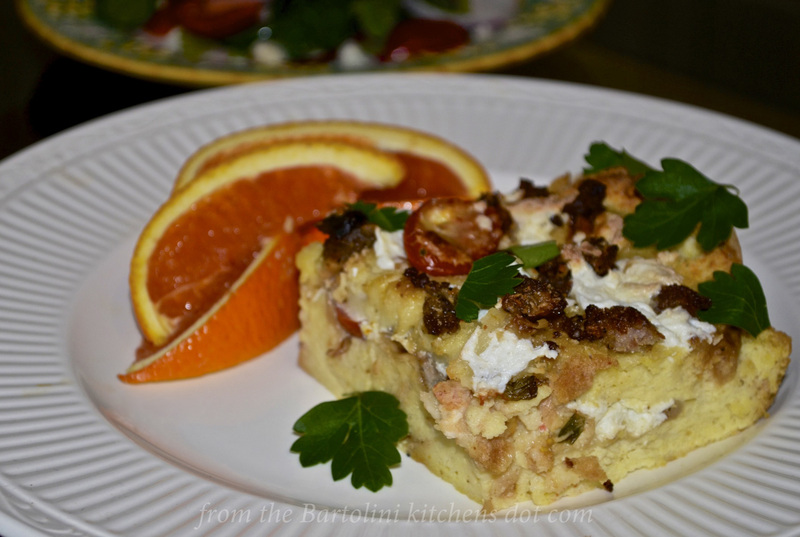 Your recipe looks wonderful and perhaps it will inspire me to move out of my comfort zone! Congratulations on a successful blog, you certainly deserve the numerous follows! Thank you. That’s a very kind thing to say. Sounds delicious and the sandwich looks excellent. I always look forward to your posts. Thanks, Roger. I feel the same about your efforts. I may not comment after every post but I never miss a one — and I always leave with a smile. Yum nice use of the homemade plum jam, I just happen to have made a batch last week and I have a pork fillet in the freezer, that’s dinner sorted for tomorrow night! It’s always good to see you around John, whenever you have the time. I will definitely be around, I have a tendency for OCD-type behaviour. If I sit at my Mac at 9:00 am, I will probably still be here at supper time. I have to put some constraints in place. I truly do, however, appreciate your support and understanding. Thank you. Hah I relate to the OCD! what joy! reading your new post at the Charles de Gaulle airport waiting for our flight to go home! What a kind thing to say! Thank you, Sally. As you saw, I often use pork tenderloin, sometimes with prunes wrapped with bacon inside, but I love your recipe. Plum sauce is a great idea. I do know how well you prepare pork tenderloin, Sylva. Because of that, your compliments are very much appreciated. Thank you. As always a scrumptious mouthwatering meal John! It seems we are all battling to post as much as we used to and get to all the other blogs who follow us. Fear not dear friend, we are still here and will speak with you when you have the time. Have a beautiful day and give Max a scratch from me. Well, bring them with you when you visit, of course. We’ll just have to keep them all away from any plastic surgeons. Thanks, Marie. I’ve got so much jam around here that I’m going to keep experimenting. I do not know how some find time to blog anything. If I had 2 little ones underfoot like you, I just couldn’t do it. Lately, this blog has undergone a growth spurt that caught me completely off-guard. I have to make some changes or I’ll be overwhelmed. Plum tasty is right and the photos look as good as any good mag,John. Your blog must take a lot of time to prepare and it is thorough and informative, well written and all the cooking time, too. A standout in the food blog arena for sure. Your accompanying stokes are enjoyable even if folks are getting takeout instead of firing up the stove. It is always a delight to find a comment from you on my blog and I appreciate your making time to visit And write. I know how hard it is to tend a blog and write to all the generous readers who like and comment. Shared all around as everyone loves to reAd Chicago John! Thank you, Ruth. You’re comments are alway so complimentary and supportive, especially when it come to my photos. How I struggle with them and how kind you are to mention them. This looks delicious and I love the leftovers baguette, but it’s that Sician Strata that I’m REALLY looking forward too – it looks amazing! Thanks, that was a great roast! The bread was made from sourdough starter crystals that were sent to me from Celia in Australia. It’s great! This looks so delicious! I love plum jam but have not made any yet. We even have a plum tree, but the stubborn thing has never given us any fruit. Maybe this year I will finally break down and buy some plums to jam. I have been using a pear jam on my pork tenderloins. It never set quite right to is more of a sauce and works well with the pork. Congrats on all the followers. Take the time to enjoy life too, it e at the computer can get away with you if you aren’t careful. Not that I have that problem…too many noisy hungry mouths around here! Oh yeah! This one is going to happen!!! I hope so, Teri. It’s a good one. I’ll be doing it again and soon. Such a beautiful recipe you’ve shared with us today – that tenderloin all coated in plum jam, balsamic and wine looks absolutely mouthwatering! Great photos! Thanks. That plum jam was an eye-opener for me. I will be making much more this season, and not just Damson. Make sure to save some for a tray of “bukta”! You and me both! Thanks for dropping in and commenting. Thanks, Nancy. That’s a really nice comment to leave and I appreciate it. Thank you, la Greg. This was one roast I was sorry to finish. Whether served sliced on a plat or in a sandwich, it was very flavorful. I thoroughly enjoy it cooked this way. What an ideal use of plum jam, taking pork roast to a whole new level — YUM! Thanks, Judy. 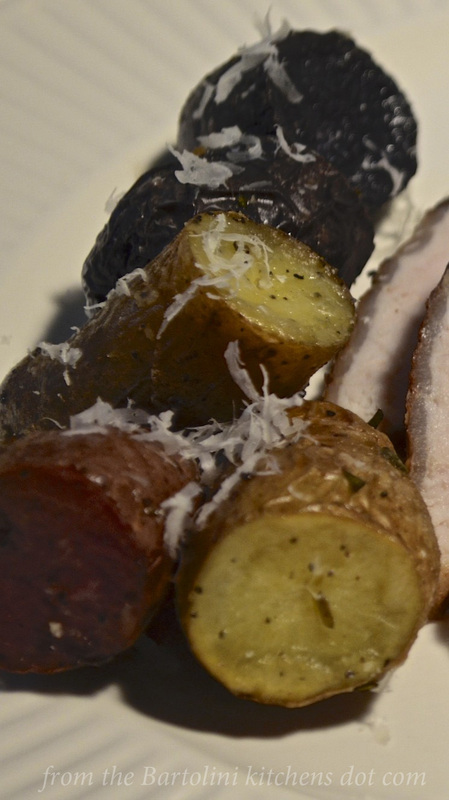 It is a great way to cook a pork tenderloin and, really, quite easy. No worries about comments. I’ve been unable to keep up as well, so I do understand. And the reverse is also true. I love your blog, and if I don’t always comment, it certainly isn’t from lack of interest…. Thank you for being so understanding. I never dreamt my blog would grow to such proportions and so quickly. Since December, it’s grown 30%. I was not prepared for that. Excellent! Although about a week late! We had pork tenderloin last week and I was scrambling for a sauce. Oh well, next time for sure! Thanks! Thank you for that shout out and link John, I am quite flattered to be included in your beautiful blog. The pork with plums is a wonderful combo and really takes it up a notch from the standard pork with apple sauce. 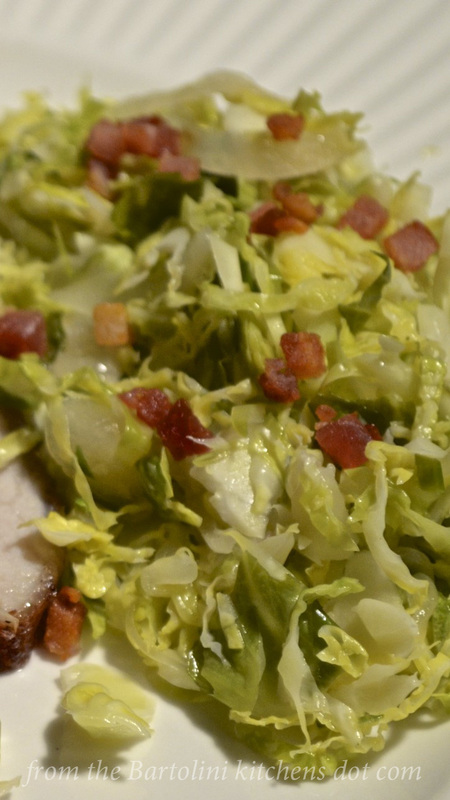 And I can see how it went with the Brussels sprouts the flavour must have been incredible. I really love the rich colour your beautiful sauce also beings to the plate. I’m definitely bookmarking this for mr next dinner party. We’re rather fortunate because we live in a very Eastern European neighbourhood and we have various plums available all the time, in fact I just saw some exorbitantly price plums the other day. The small summer plums would be ideal, but in a pinch some of the others would do too. No worries about laying low, we’re in the same boat, well except the number of followers, congrats! What a wonderful accomplishment but not at all surprising. You are a very good story teller and following your blog takes us all right into your childhood home as if we were flies on the walls. You are also a thoughtful and generous commenter so reciprocity is not surprising either, I am proud and humbled to be in your circle and to call you a friend. Plus we all really like your cooking 😍! I’m the one that should be doing the thanking, Eva. Those Brussels sprouts were very tasty. In fact, I’ve already bought more to make it again. Funny you mention plums being available.I specifically went out Sunday, looking for plums and found none. It will be a different situation this Summer. I’m going to buy and preserve as many as I can. I want to see if other varieties will work as well as the Damsons do. Sorry to say, there is no Bartolini story to be told regarding the Strata, well not specifically. I do have something special planned, though. Perhaps the greatest benefit I’ve reaped from blogging is becoming a part of this community and meeting fine people like you and JT. I feel quite fortunate to know that you both are my friends. I am so touched John, thank you. I had a situation like your January only it was one day, with no apparent reason my hits quadrupled! I still can’t figure it out. I had one a year ago like that too…strange indeed. I am so pleased that your blog has taken off as it has, you deserve the recognition, it’s a wonderful repository of great recipes and heart warming stories. I can’t wait for the surprise. Plum jam can be very interesting. I had it once with some local soft, breaded fried goat cheese. It perfectly complemented the savoury flavour of the cheese. I can imagine that it’s an explosion of flavour in combination with the juiciness of the pork tenderloin. Yes, plum jam is very good served a number of ways. I preserve a number of jams and most go very well with goat cheese. Together, they make fine crostini. Here, it was a perfect match for the pork tenderloin and I enjoyed it very much. Thank you for visiting and for taking the time to leave such a nice comment. This dish looks so very tasty! 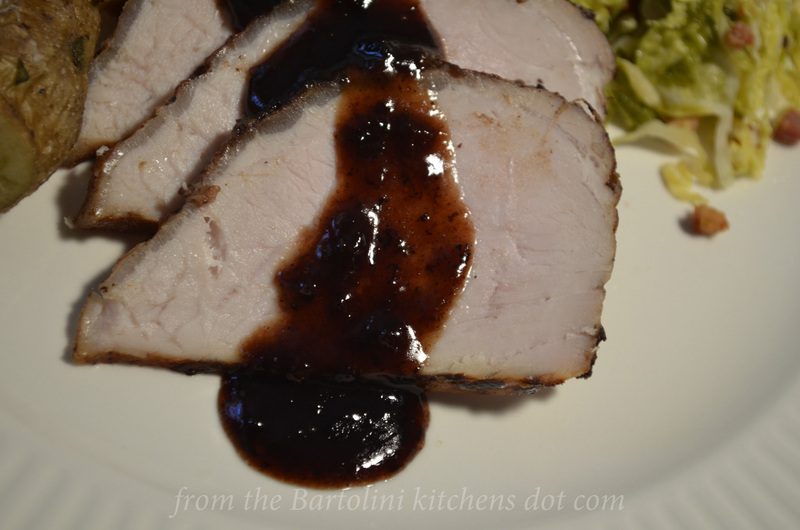 Pork is really at its’ best with fruity sauces, and I also love the use of the Balsamic vinegar in the sauce. I use it a lot in marinades for chicken. It adds such deep flavor and color. Yes, pork is a versatile meat, isn’t it? I, too, love it with fruit and this jam-based sauce works very well. Like you, I;m a fan of Balsamic and use it quite frequently, too. Thank you, Ronit, for visiting and leaving such a nice compliment. That tenderloin looks so juicy, tender, and absolutely delicious! I’m surprised there was enough left to make sandwiches! Thank you, Mary Frances. I rarely entertain if the meal is going to become a part of the blog. I do not want my dinner mates to sit and wait while I fuss with a camera. The fact that I got to enjoy that entire roast is purely coincidental. First, congratulations on your vast number of followers – it’s for a very good reason – you’ve got a great blog! That pork with the plum sauce looks divine but I don’t think we’d have any problem finding the plum jam if you would just give us your home address. See – problem solved. Keep on blogging John – I love it. Thanks, Diane, for the wonderful compliments. I do appreciate them. I’m sorry to say that I’m just about out of plum jam. You see, I was having problems getting good photos, so, I just had to make the roast again … and again. May I have the same problems with more recipes. I was eating mighty good! Not to worry, I’m not quitting. I just need to spend less time at it, that’s all. Oh my!!! My, my, my. Guess who fell off the veggie wagon. It was me. Mike is still rolling right along; although he couldn’t resist a good sausage pizza this weekend. 😉 This looks really good and I can’t wait to try it. Now I just need to find plum jam. I’m very much looking forward to your cherry post. Cherry season can’t be too far off, can it?! And please don’t ever apologize for any kind of absence or miss. You can only do what you can do, and it should above all be enjoyable. Goodness knows I miss my fair share of things or take weeks to respond sometimes. It’s too hard to do it all. Besides, you know regardless of how often we have time to comment, you’ll have a lifelong follower in me. 🙂 I’ll email you soon with Mr. N’s show times/dates. Yes, pls sent the show info. I cannot wait to see him on stage. What a treat! John, I know where to come for plum jam or damson jelly now, as I’m a spectacularly lazy canner. OK let’s re phrase that, I’m the only one who eats jam, and very little at that and there’s a tendency for jams to sit in the fridge for sshhhhhh years !!!! This looks really good; I’ll try to forget about it while we eat tonight’s sallmon loaf. John, not only are you a great storyteller, you’re also a considerate responder to your commenters, a careful reader, and a friendly commenter on others’ blogs. Thanks for ‘fessing up about being the victim of your own success. Tonight, a hundred people around the world will go to bed relieved to know that they hadn’t offended you or gotten stale. Oh my gosh, I’m so excited to see your pork loin with the plum sauce here at last, John! Thank you so much for the shout-out, too, so kind of you. 🙂 The flavors you chose to go with this sound amazing together…the riesling, some ginger, the balsamic to cut the sweet and the rosemary for the herb factor. I’m gonna have to try this one, even though I haven’t made jam in a couple of years and never plum jam. Maybe this is the year…I might even be able to get damsons since I don’t live in Chicago! 😉 And I can’t wait for your strata. Strata and bread puddings are my faves. Have a great rest of the week and weekend! Thank you so much, Betsy. It did take me some time but the roast was worth the wait. I’m definitely going to try this roast with other plums. I don’t think it will matter too much, so long as I make the jam and limit the sugar content. I do love this Strata. Best of all, it’s so convenient and versatile. Spice it up or tone it down, it will still be tasty. And if you’re expecting a crowd for brunch, assemble this the night before and you’ll serve a great meal without spending that morning in the kitchen. It works for me! That last bit is my favorite thing about strata and bread puddings…making them the night before. Not only convenient but allows the bread to soak up the custard more. I love making them for Christmas breakfast especially. John, I would love to try this recipe soon! And thanks for the plum jam recipe. If our plum tree produces fruit this year (I kinda went overboard with the pruning shears), this will be my first attempt at plum jam. Thanks, Arlene. I hope your tree “comes through” for you this season. Plum jam is easy to prepare and remember you do not have to can it. You can put it in jars, let it cool, and then freeze it, where it will last for a year or more. Jam making is so much easier if you don’t have to process it. Thank you so much, Shanna. “ChgoJohn, Evil Blogger.” Hmmm kinda has a nice ring, don’t you think? 🙂 I am such a fan of rosemary and I use it all of the time. I love the aroma of it being cooked. It fills the kitchen so nicely. I’ve yet to try sprouts shredded in a salad, though. It’s only a matter of time because I love them. too. Hope you and your family are having a great week, too. This is over the top delicious looking ….and on my bucket list ! Everything here is fabuloso! I totally understand about needing to limit your daily blogging time. I’m trying to pull back a bit, and it is not easy! Thanks, Angeline for the compliment and support. I had hoped that taking off the month of January would give me a fresh start. It didn’t and I’ve been far behind ever since. I have to change the way I do things or the fun will be sucked out of this and that’s the last thing I want to happen. Lovely recipe, John, which I’ll certainly try . . . I can easily get both the plums and the jam here! Writers ahead of me methinks have already put down most of what I have to say re you ‘being sensible’ about your blogging. It is meant to be a fun interest bringing so many of us together in the same place: putting out a blog such as yours takes enough time and is for our pleasure after all – making it ‘work’ with which you can hardly keep up is not fair on you or any other bloggers who have caught the interest of the blogosphere. I don’t have my own blog but with fulltime work, study, a large enough garden and many local interests with lots of regrets I too am being sensible and visiting friends when I can . . . .just keep on posting these wonderful blogs!! Another winner John! Glad we didn’t get what they were calling for. But enough is enough! Thanks, Dave, and you’re so right. We’ve had enough for this season! Plums and pork go together so well. This is a wonderful looking meal. Plums are so plentiful in Sydney right now and I have many jars waiting to be filled. I should stop procrastinating and make some jam before the season is over. Congrats on how well your blog is going and how quickly it has grown. I’m not surprised you have such a following. This is a beautiful pork roast, John. I am not all that confident with roasts, so I find your recipes really helpful. I have never done a pork roast on the stove top, and I think it would keep the meat moist and be a little easier to monitor. And the plums really delight me. I almost signed up the other day for a class on canning and preserving. I couldn’t make the particular dates align with my schedule, but I’m getting more and more eager to expand my abilities in this area, too. We have so many wonderful fruits and vegetables available year round, but once again–confidence lagging. I’m a “take a class” person! John, I have almost half the number of followers and regular readers…and I can’t keep up! I get it! There is life to live, too…although I’m pretty addicted to this blogging schedule, whether it’s a smart move or not! LOL! Be well in these last days of winter! I saw the comment about your snow this week. Good grief! P.S. How’s your pup? Haven’t heard about him lately. Everything ok? Miss his adorable mug. I even have him pinned on my doggie board. I am a crazy, crazy dog lover and Max is totally loveable. Thank you so much, Geni. Everyone has been so kind and supportive. It really does mean a lot. Well, if you’ve used apricots with pork, you’ve got a good idea of how well fruit, in this case plums, will work. I thought the fig preserves I used was a good dish/ This one was so much better. I hope you do give it a try sometime. 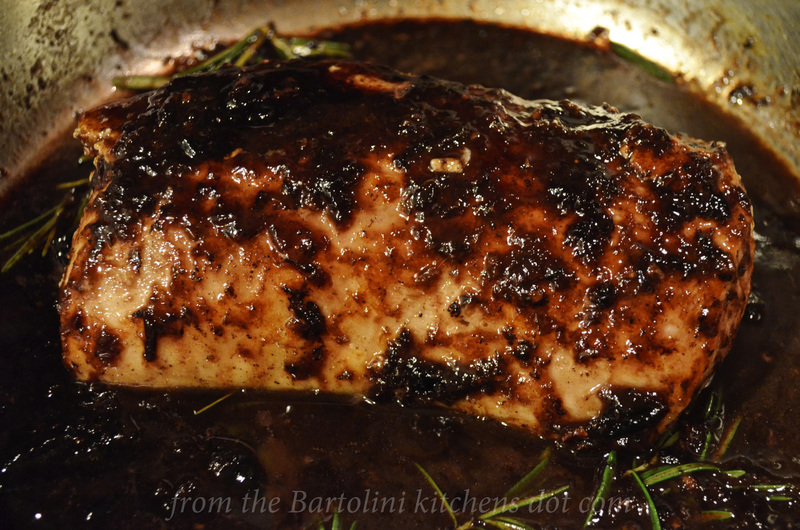 A pork tenderloin never dressed more beautifully. The sides are perfect choices. Can’t wait to have a dinner party and serve this dish to my friends. WELL DONE! In my keep folder. Hi John, I love this post …. the reason being I love making preserves, I love making them more than I like to eat them on toast so I am always on the lookout for ways to use the multitude of jars I have in my cupboard – I am thinking my melon, ginger and lemon jam might go well with pork mmm …..I think I am going to try it. BTW I recently came across Sallie’s Greatest produce (http://salliesgreatest.com/), Sallie is from South Carolina. She makes jams using fruit and herbs. You may want to look to see what combinations she uses. A lot of her jams go well with meat or cheese, I have a jar of the fig, sweet onion and rosemary jam. Thanks, Glenda. Between our mutual love of roses AND love for making jam BUT not eating it, we may be long lost relatives. 🙂 I, too, use jams with other roasts and sauces. Why not? Sure beats another piece of toast. I bookmarked that website. I bet i can get a bunch of ideas for making jam this Summer and roasts next Winter. Perfect! Thank you, too, for being understanding of my current dilemma. Over 1100 followers? Nice going! (Although I must say I am not at all surprised.) Blogging is fun and you meet many interesting people, but life must be lived too. Now this sauce looks scrumptious. My mother used to make plum jam when we were little but, as she constantly reminded us, it was only for Toast. I’m going to tell her about this. I think it will blow her mind – but in a good way. I remember that Damson Jam and Betsy’s comments, guess I’ve been around here a while, eh:) I think that’s been the absolutely second best thing about blogging, being encouraged to step out of our comfort zone and try recipes that we’d never done before.. like canning. I find you blog and others always so inspiring, it’s just finding enough time to try them all! I love plums.. love pork, so I’ve got to try this. Plums won’t be ripe here for some time, so later on I’ll have to make the jam to have on hand for the winter like you did. The first best thing about blogging are the bloggers we meet!! So glad to be here all this time in the Bartolini Kitchens:D I think it’s important to limit blogging time.. we’ve got to get out there and live our lives so we have stuff to blog about, right? You sure did make a lot of good points, Barb. Blogging has certainly encouraged me to step outside my comfort zone. I’ve a much more “cosmopolitan” cuisine that I once did. I’m gaming my own harissa and just 3 years ago I didn’t know what it was. I’ve always had an adventurous palate but now I’m more adventurous in the kitchen — well, except for baking. Some things will never change. 🙂 And I certainly agree that blogging has brought so many truly caring, talented, and wonderful people into my life — and you are certainly one of those people. I feel so lucky to have gotten to know you. I’m familiar with the combination of meat and plums. It is great and your dish looks fantastic, John! Thanks, Francesca. Pork and plums do go vrry well together. This roast was delicious. I, too, am going to start a schedule and only spend one or two hours a day blogging. I’ll be much happier and so will all who come to my blog. Plum and pork plus sides! Oh my! I can’t wait to try this with the pig I ordered from a local farmer and roasted Italian plum jam. Yum yum yum! Oh that’s funny! My nickname is “Cheeze Queen”, aka queen of the nerds, given to me by my older sister Rachel when I was 13 lol. The “Queen of Jams” is a nice upgrade! Hi John, as you know I’m not a pork eater but I am a jam maker and eater! Besides, you can use jams and jellies with chicken and turkey too so it all good. I remember your damson jam post…and you know what? I still have my frozen plums in the freezer! I never did make anything with them***sigh***. I do love your fingerlings with the cheese….yummy! Delicious treat down to the tasty leftovers. Have a great week ahead. Fruit-based glazes and sauces are such perfect companions for a pork roast or loin — I bet this would taste good with a Cornish game hen? I have not had the time for blog-related activities as much, either — good to have diverse interests, both in and out of the blogosphere! Look forward to hearing from you however frequent or infrequent that may be. Oh john, this looks so good.Blogging can be a real time consumer. Totally understand as long as I can still get your awesome recipes! And stories. You have such heart and I love it! I do love pork tenderloin and can’t wait to give this a go! Make mine a bit thicker! Not that I’d argue with that offering. Looks wonderful. Plums and pork. What a lovely combination. So rare for me to find local plums here, but I keep looking every summer. Plum and pork – brilliant! A fantastic combination that I will be sure to try sometime. Thanks for the inspiration! As far as your presence in the blogosphere, I certainly understand that you can’t spend all your time doing this. I’ve always appreciated the thoughtful comments you’ve left and your attention to detail in them, and also marvelled at how you could do all this. I’ve been challenged to keep up with my blog reading and commenting as well. There is so much more that goes into blogging that I was originally aware of — all the social media alone takes a great amount of time. And life, of course, continues to divert our attention to other challenges and opportunities. I think it’s wise that we focus first on our content and then fit the rest in as best we can. It’ll just be even more of a treat when I hear from you! Looks great indeed! I also like plum jam with lots of fresh mint to go along with lamb- yummo! Wow – what a crowd of followers you have! Can udnerstand why though John. Of course you can’t keep up with so many others and respond to all comments…it becomes a full time job 😉 We’re back in the land of pork now and Big Man is looking forward to lots of pork dshes. I love the way sweet and salty go so well together and this looks like a wonderful dish. My plum jam is made from plums from our tree but they are golden…could be interesting. Otherwise I’m also thinking about how well chinese plum sauce and pork go well together….you’ve got me thinking about food again! Take care…. 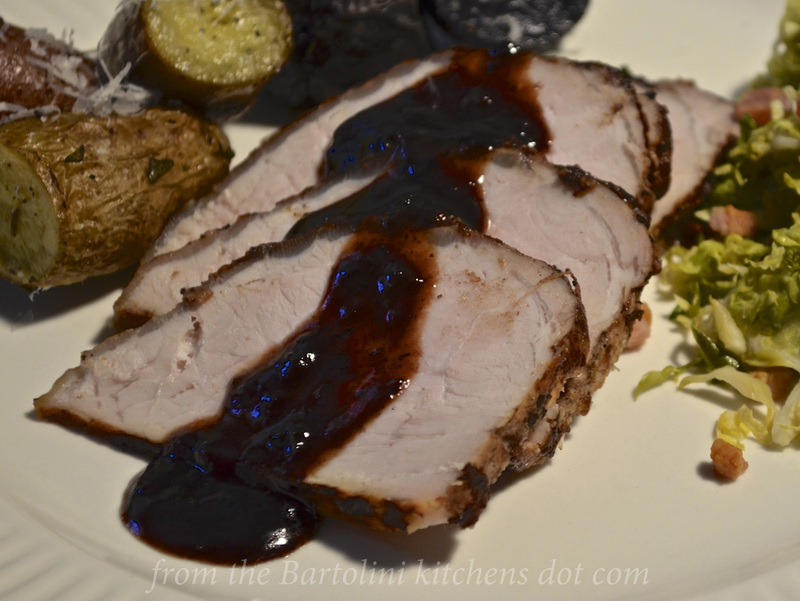 Plum sauce made boring pork loin or even turkey breast into a nice dish…. You know me, wild about pork in pretty nearly all of its delectable forms. It is *such* a great friend with fruits of all sorts, but somehow I think it’s particularly friendly with the ‘dark-flavored’ (more intense is a better way to say it, perhaps) fruits, and plums are, in Mary Poppins fashion, Practically Perfect in Every Way for this pairing. Beautiful post!!! This looks so delicious! I bet the plum jam gives it a wonderful taste! Yum! That plum flavour combined with the pork sounds delish! This pork dish looks very tempting John! Love plum sauce and your leftover idea with that sandwich looks utterly delicious. John, your pork looks magnificent! What a perfect combination with the plum jam! I hope all is well with you on your side of the world, dear friend, and that spring is just around the corner! Thank you for the compliment and for including this recipe in your posting. It’s really quite an honor. I’d replace Pork with Beef but I wouldn’t replace a thing about that silky, seductive jam! O My!